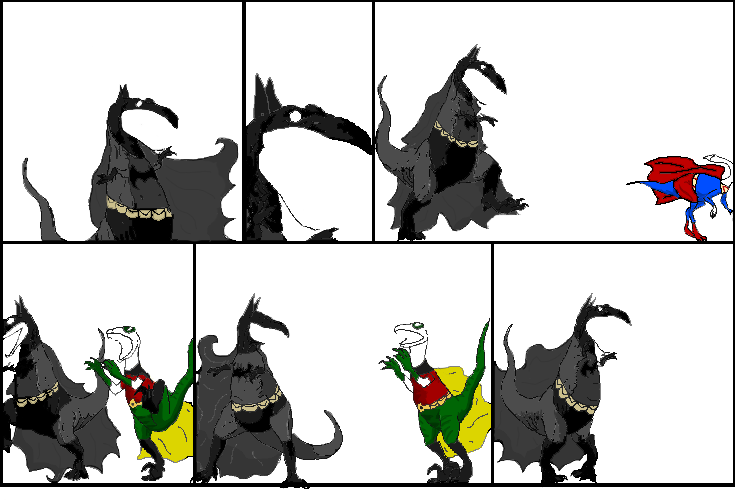 Dinosaur Comics - October 30th, 2009 - awesome fun times! October 30th, 2009: Many web hosting companies - with a few exceptions, including Voxel.net, who host me! - are terrible, terrible beasts, relying on consumer misunderstanding and literal hostage situations to make their money. Kate Beaton is unfortunately in one right now: her host shut her off, wouldn't even let her upgrade, and then everyone at the company turned off their phones and stumbled home for the night. ANYWAY. Her site was down, but we said "You know what? No it isn't." and put together an Emergency Backup Site running here, at qwantz.com/harkavagrant. It's quickly-adapted Qwantz Code on the backend, and it's only got the most recent comics, but it's where you can go for Kate Beaton goodness until she has the hosting situation sorted out! Harkavagrant.com is pointing there, but depending on your DNS servers you may still see the old site for a few hours. One year ago today: if you didn't recognize any of the product slogans in this comic, YOU ARE STILL FREE! RUN! TELL THEM MY STORY.